Full Plus500 review | See what real traders think about this Forex broker here! This broker is primarily a CFD broker, but they offer CFDs on several tradable instruments, ensuring that traders can still trade whatever they like. Plus500 is currently one of the most popular CFD providers in the world, as can be noted from the rating of its trading apps. The company was started in 2008 as a CFD provider, and since then, it has grown to be a global brand offering the same service. The company is also listed on the Alternative Investment Market (AIM), which is a subsidiary branch of the London Stock Exchange (LSE). The listing on this exchange occurred in 2013, and a year later, by February 2014, Plus500 had a valuation of $1 billion. As a leading CFD provider in the world Plus 500 was the first broker to offer a CFD on bitcoin, enabling traders to speculate on the value of bitcoin in major bitcoin exchanges. Since 2018 Plus500 Ltd’s ordinary shares are listed for trading on the London Stock Exchange’s Main Market for Listed Companies. Several others have followed suit, but Plus500 remains to be the pioneer of the trading instrument, but that is not all they are known for. There are many other reasons that have made Plus500 reviews so positive. There are still some who claim there is a Plus500 scam, but most of these statements are made by bitter clients who lost their investment. Plus500 CY Ltd is authorised and regulated by the Cyprus Securities and Exchange Commission (License No. 250/14). However, they still do not accept US clients. The company is also the main sponsor of the Spanish football club Atletico de Madrid and you can see their logo on their jerseys. All of Plus500’s tradable instruments are CFDs, which means that they are derived. There are several advantages to using such a system, but the main one is that it doesn’t require a very large capital. Being a derived product, the total value of the asset is not needed, hence the smaller capital requirement. 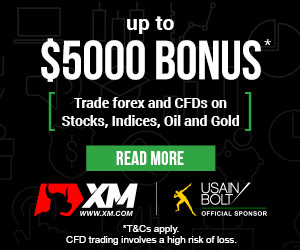 CFDs can be created for various financial instruments, and Plus500 has CFDs for Forex pairs, stocks, indices, commodities, ETFs and even options. Plus500 was also a pioneer in the provision of online CFDs on options, which allow a trader to speculate on movement of indices. Options are a far simpler trading tool, and yet they remain to be very profitable. Offering CFDs on ETFs was also another brilliant trading instrument, because ETFs cover a basket of assets from stocks to bonds. 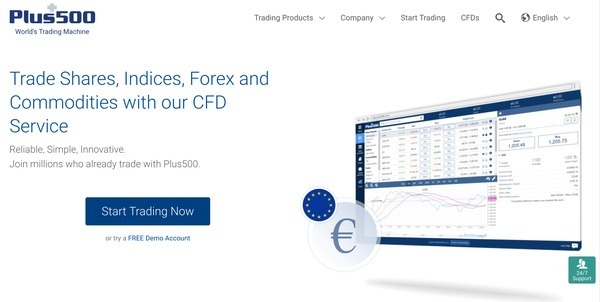 As Plus500 CFD broker, the company offers over 50 currency pairs, all of which can be traded as CFDs. If you would like to invest in stocks, Plus500 should be your preferred broker. Since the company was founded, they offered CFDs on shares, with the advantage of not charging a commission. Stocks carry a huge cost in terms of commissions and minimum deposits, but Plus500 online broker makes the process a lot easier. All you will be charged is a spread, which is more affordable than a commission, especially when you factor in the leverage offered. Stocks from 20 countries’ exchanges can be traded with Plus500, and there is no shortage of shares. The minimum deposit for opening a live account with Plus500 trading broker is $100, but you can still practice on a demo account for free. You can make your deposit in various ways, from the commonly used payment service providers like Skrill and also through bank transfers or using your debit/credit card. To further increase your access to the markets, a leverage of up to 30:1 is made available on some instruments like Forex pairs. More complex trading instruments like ETFs will get you a lower leverage, which is still more than enough. Plus500 have their own trading software, from which you can access all the products they offer. These trading platforms can be downloaded to PCs, Macs, Android and iOS devices so that you can access the markets whenever you want. Some traders may find this proprietary software different from the more common MetaTrader platforms, but they soon realize how capable they are. After launching the trading platform, it quickly became the most popular on the Apple App Store for trading CFDs, which indicates that it is indeed easy to use.